Day breaks and Wag leads a canine chorus, a cacophony of barks and howls that speaks of happy animals. The performance continues until Brian steps outside and growls. Wag may be leader of the pack but in absolute terms Brian is top dog. Chains clang to the ground in the dust and Wag, Bo and Spy chase each other in glee, while Bonnie and Clyde bark indignantly; the little ones won’t be coming on this morning’s muster. Brian swings aboard the Black Fiend , I prod Desley out of her slumber and the three working dogs fall in behind as we head out to Creek Paddock. Here we split and Desley, Bo and I climb the northern ridge. Bo, with his deep bark, encourages the cows to move to the water and on the far side I can hear Wag doing the same. The cattle coalesce and amble downstream. At the end of the paddock Spy takes over, turning the mob through a gate and onto fresh grass. With dogs the job is quiet and easy and the stock have not moved out of a walk. We point the horses in the direction of home and their pace quickens in anticipation. Wag limps slightly as arthritic joints, the legacy of a vehicle accident, show his age. 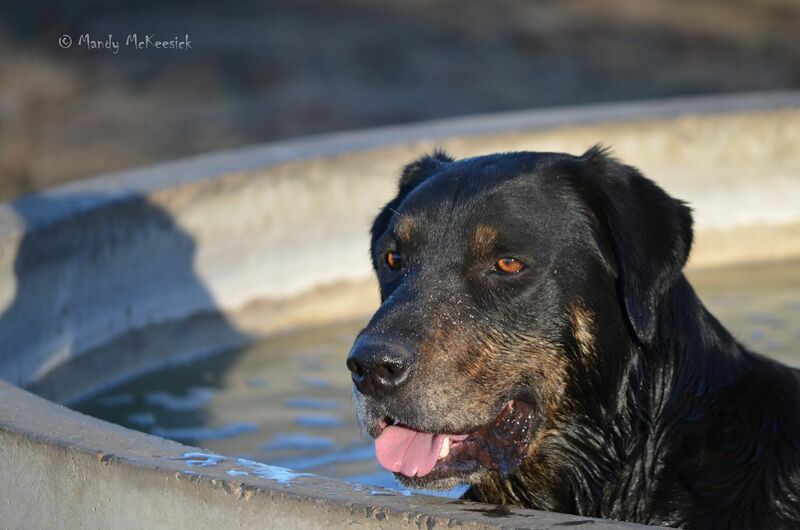 Bo’s tail has not stopped wagging since he awoke and it amplifies as the huntaway cools off in a cattle trough. Back at the house a local farmer is waiting. 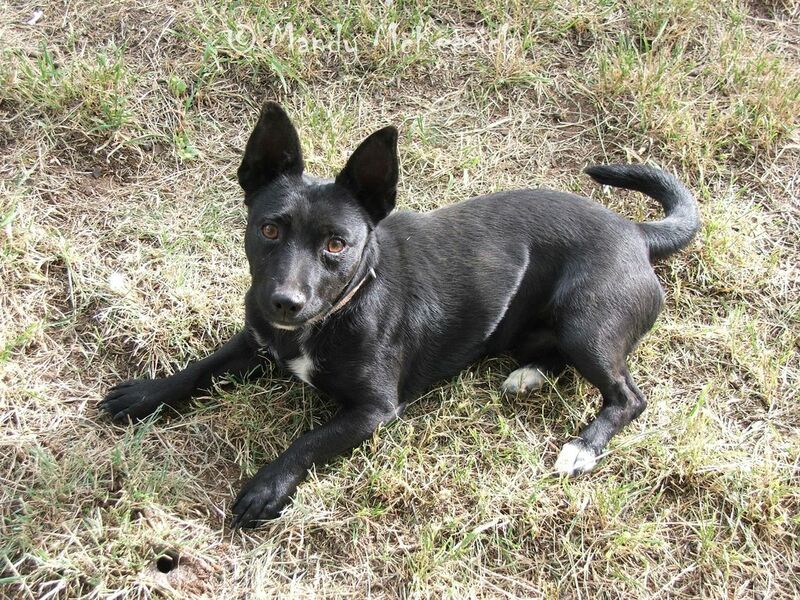 He breeds border collies and would like to borrow Spy. Spy leaves looking perplexed and returns three hours later looking the same. The bloke is not sure if anything happened. Well what does he expect? Where was the romance? Where were the flowers? Three hours – phfff. In the afternoon the three big dogs snooze at the end of their chains and Bonnie and Clyde are released. Miffed at missing the day’s action they disappear to create their own. Minutes later grunts and squeals can be heard from the hill. The grunts come from a feral pig bailed up by two fox terribles. The squeals come from Bonnie. She gets so excited when she finds quarry you would think she was stuck under an electric fence. Alternatively think of the sound of tyres braking suddenly on a wet road. Clyde just turns into an uncontrollable maniac. Pursuit is pointless at this stage. Fun over the two terriers return. Clyde still has a frenzied look in his eye. Bonnie has lost the fight. She has skin missing, has a swollen eye and is feeling less than lady-like. They will never learn. By nightfall there is once again enthusiastic barking as all dogs have one last run before dinner and bed. Bonnie turns her sweetest look to Brian in hopes of a night inside on the couch, but she smells like a swine and is declined. The top dog has spoken. Not that Wag cares – he has knocked off. 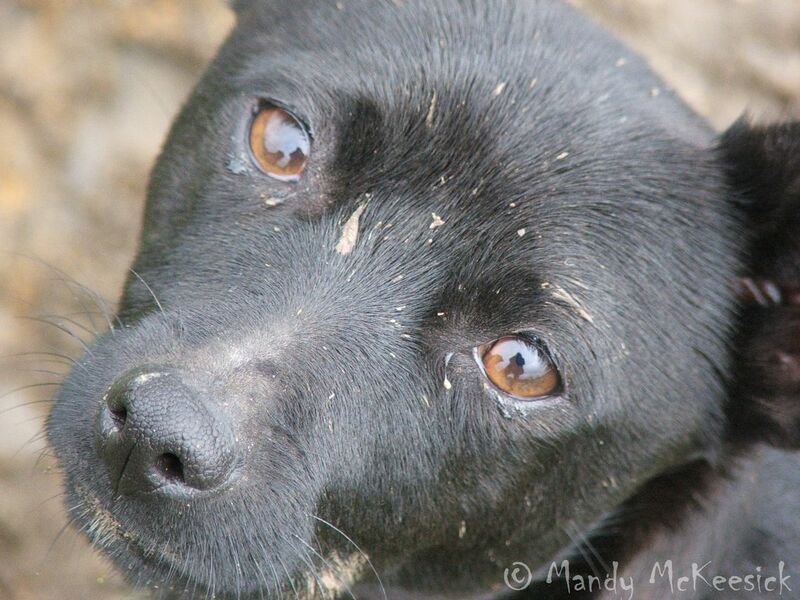 This entry was posted in Hound Dogs and tagged border collie, farm dogs, huntaway, miniature fox terrier, mustering, working dogs. Bookmark the permalink. Great to see the family is keeping busy . Judi loves seeing them all again. 1770? Gee life is tough for some! Glad you’re enjoying the rambles. Take care and call in next time you’re past. Nano cat was our top gopher catcher back in the days when he was an outside feral who showed up out of nowhere. He would bring fresh kills up to the porch, tenderize them by throwing them against the sliding glass door a few times, getting our attention, then ingest them head first. About 6 bites and they were gone. Gophers he would eat, shrews and mice were piled up and left for us. Eventually something out there ended up trying to eat him, and after the second fix-up visit at the vet, he came inside. Couldn’t stay out of trouble, that one. Old Klaatu, the wild feral who loved a dish of cream served up on his wine barrel, but was unapproachable otherwise, did his best during his short life out there, but was never quite the same hunter Nano was. These days Nano watches the shower drain, expecting a gopher to emerge. Fortunately hasn’t caught anyone yet. I laughed at the thought of a gopher coming up a shower drain. Cats are amazing hunters. Thankfully the foxies have none of their skill level. The first picture. Puppy dog eyes. Hazel used to make that high pitched over excited squealing too when she’d be after a rabbit or a roo. Luckily she never bailed up a roo but she was a good rabbitter and mouser in her day. We must have fast rabbits here because try as they might Bonnie and Clyde have never caught one. Pep was the go-to dog if you wanted a mouse caught. What is it with this younger generation? ?